Larson Park is a municipal park in my town and not that far from me but I don’t go there too often because the opportunity for photographing flowers in pretty limited. They have a wetlands section that I guess has most of its blooms in the spring but I’m always too early or too late. They have another large section of perennials and annuals planted as a border on one side of the playground. The bed is about fifty feet long which allows for a lot of flowers but the problem is that it’s eight or ten feet wide and the flowers are set back in the center. Very hard to lean in and get a good close shot. I could probably step in a bit on the mulch to get closer but I decided a long time ago that I would never step in someone’s flower bed; just a bad practice no matter how careful you are. Of course it is a municipal park and I pay taxes for it so I guess the flower bed is part mine, but still. So now that I’ve established my excuses for not going to Larson very often lets look at some photos taken there. The first three were taken as I was walking in the the back of the park. Behind the park is a very large field. Much of it is taken up by a baseball field but way out in super home run territory there is a creek that runs parallel with right field toward the foul line. The bank of the creek is thickly covered with bushes, saplings, trees, and tall grass and weeds. These first three photos were taken on the creek bank. 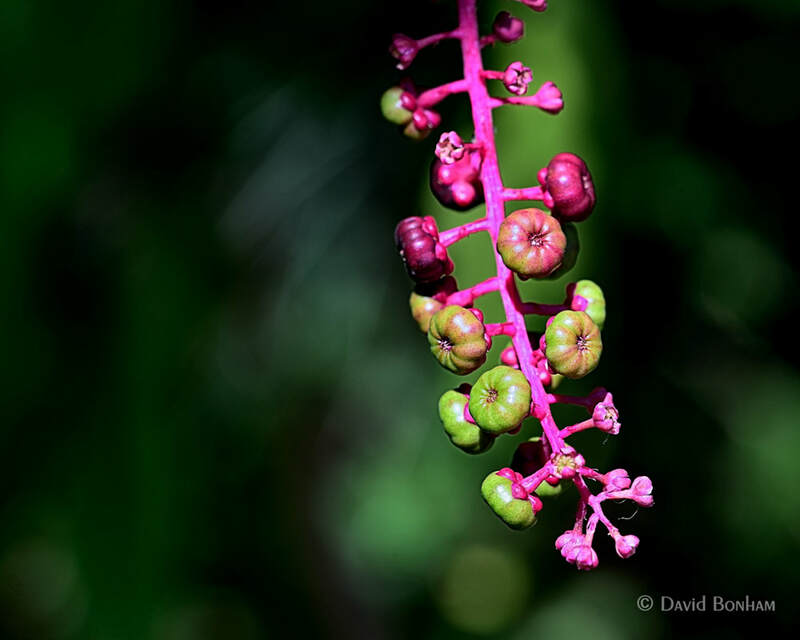 These are poke berries on an American pokeweed plant often just called pokeweed, or poke, or poke berry bush and many other names depending on what part of the country you are in. Most of these berries are not yet ripe but the two at the very top are. Ripe berries are a deep red or purple depending on the light. For centuries the juice has been used for dyes and ink. In high school several friends and I used the juice for blood. We used to shoot movies (8mm – pre VHS) out in the boonies where we found the remnants of an abandoned stone building. It had no roof and just three walls that were only a fourth to a half of their original height. Also there were crumbling three foot walls scattered around the area that at one time must have been pretty nice. This all made a perfect bombed out building setting for our WWII action films. During a shooting scene we would be sure to have a handful of poke berries to slap on our chest, thigh, arm, or where ever we would pretend to get shot. If you had enough, and did it just right, you could get a nice splat with the juice and debris flying off like a bullet just hit you. Plus it left blood on your clothes at the wound site. I would like to point out our dedication to realism using the blood red chokeberry even though we were shooting in black and white. In addition to using the berries for dyes, ink, and special effects in teenage boys’ action movies, poke has been for used medicinal purposes and for food, but just the leaves for the latter. One has to be care though because the plant is toxic. The deep large tap root has the most toxicity, followed by the stems, leaves, and berries. It’s not really the berries and their juice that’s so much the problem as it is the seeds. People have eaten the berries and not had much of a problem because they did not chew the seeds and all the seeds passed through their system. The seeds’ outer coating is very tough and they have to be soaked in water for a long time before they can germinate. 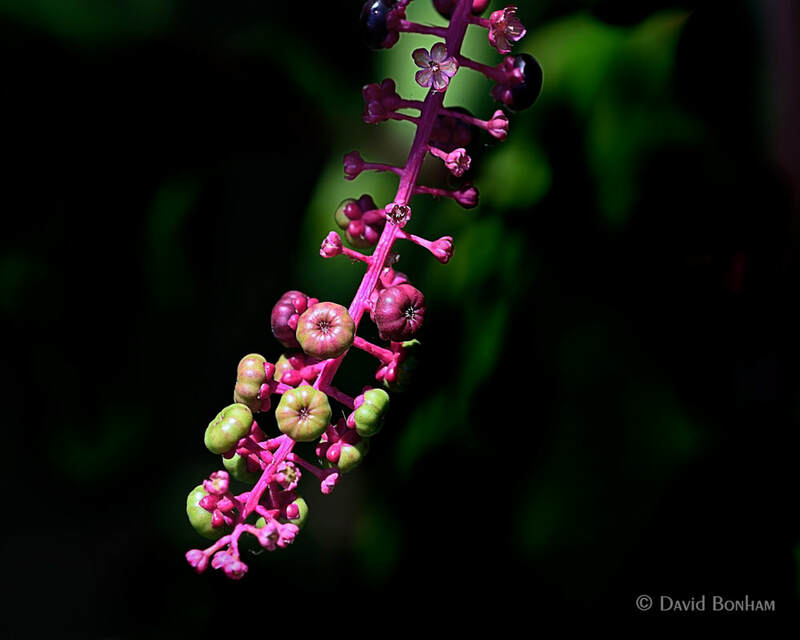 One other thing to note about pokeweed is that the colorful berries and stems, along with their large green leaves can make for some nice photos. I learned through my research that the photo above shows a left handed berry stem and the one below is a right handed berry stem. Almost all stems curve to the right or left, very few are straight. As I was walking along the creek I noticed something white and relative large that looked out of place among all the vegetation. I literally had to push branches out of the way to see what it was. 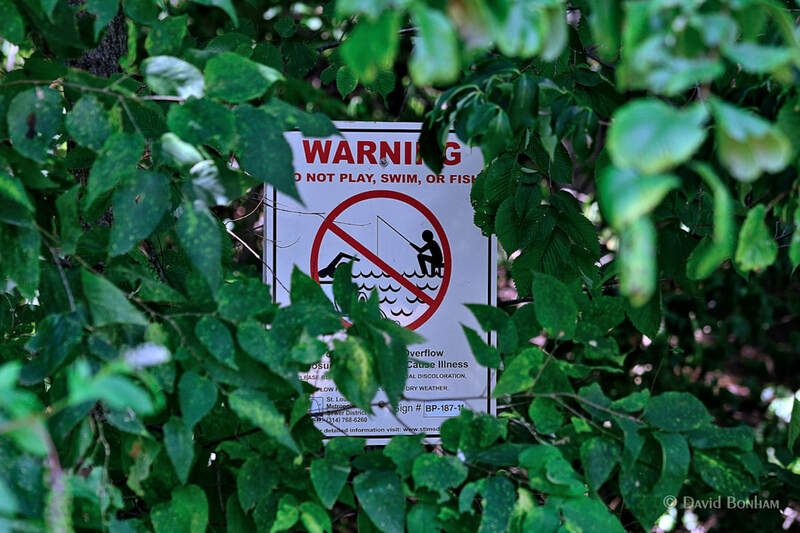 Small town government at its best posting warning signs that can’t be seen. Oops, I forgot to expand earlier on eating pokeweed leaves even though they are toxic. I don’t want to have to go back up to the earlier paragraphs and rewrite them to fit this in so I’ll just plop that info in here. I’ve nothing to say about this leaf anyway other than I really like the photo even though it borders on being abstract art. But I wouldn’t call it abstract art because we all know it’s a close up of a section of a plant leaf. I mean it still falls squarely in the real of realism. Maybe if I had altered the colors and got in closer so that it’s not recognized as a product of nature, then maybe I’d call it abstract. Hmm, guess I had something to say about the leaf after all. Okay, back to pokeweed. So, from what I’ve read you can eat ( and people do eat) pokeweed leaves if you boil them; not once but twice. One place I read was very specific. The author said to boil them once for one minute, drain them and add new water, boil again for one minute, drain them and add new water, and boil again for fifteen minutes. Seem like a lot of trouble to eat a weed. Just go to a restaurant and order one of those unsatisfying field greens salad and you can safely get your fill of weeds. This is a river oat. 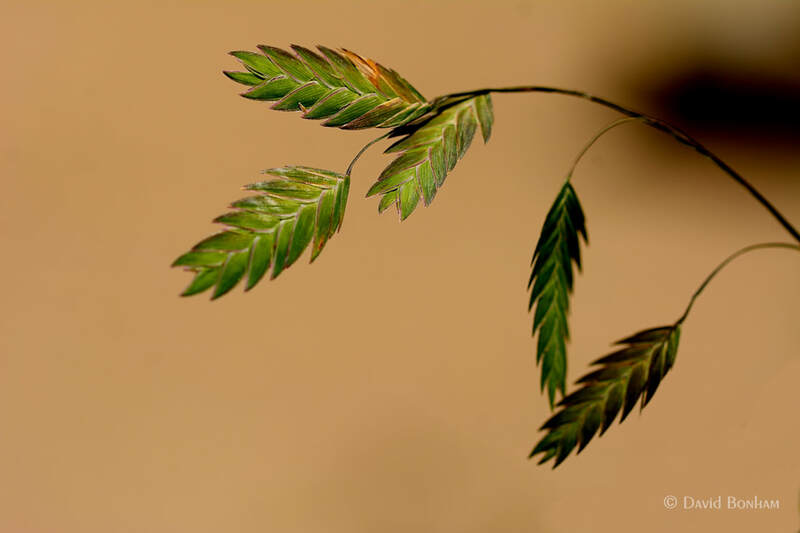 If you find them on a sand dune by the ocean they are called sea oats. Not sure what to call them if found on the banks of a lake or pond. Oh, another thing I forgot to mention about pokeweed. The white blossom are very pretty. A big contrast in color and sensibility from the pure white to the blood red. And yes, I was kidding about the right and left handed pokeweed berry stems. 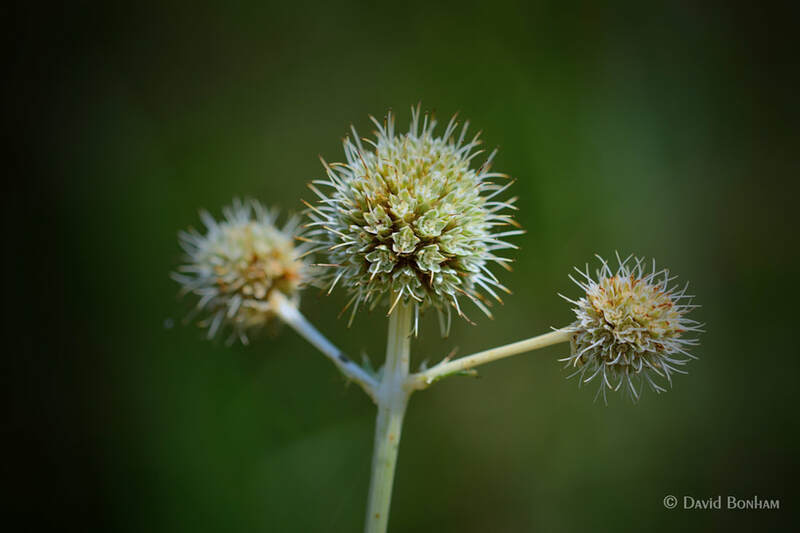 This entry was posted in Insects, Plants & Flowers and tagged Larson Park, Nikon D7100, pokeweed, river oats, Sigma 105mm F2.8 EX DG OS HSM Macro. Bookmark the permalink. Call me a cynic but I think it’s more probable J was just trying to get me closer so he could jump on me and bite me. 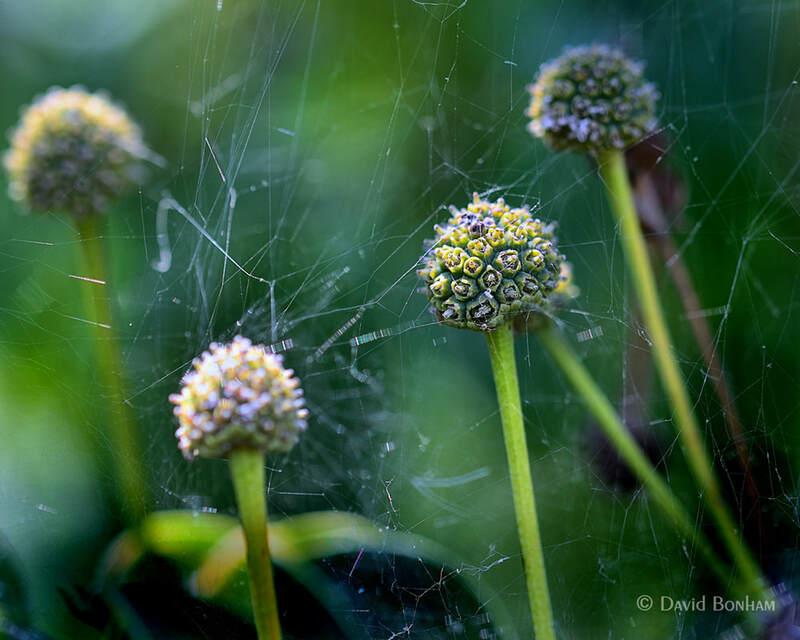 Wonderful photos, David! I could use more cheerleader plants. They really made my day! Nice explorations, David. I liked the perforated canna leaf and the cheerleading plant, whatever it was. 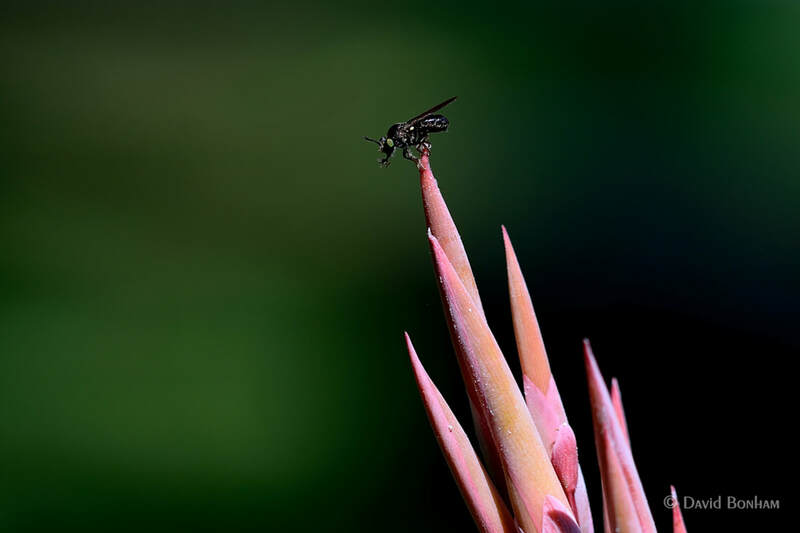 The bug bugging you looks like a robber fly, a good one to have in the garden. Thank you Eliza. 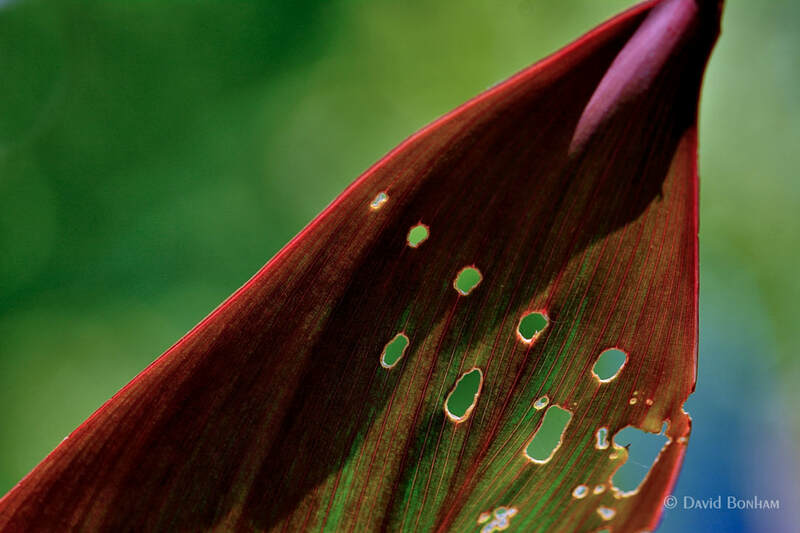 I have canna plants in my yard too and often photograph the leaves but this one was special because of the perforations and the color of the leaf; not solid green as usual. Thank you too for the bug id. Boy, I bet your Mom loved doing your laundry after your WWII filming days. We stirred the berries in our mud pies, but we didn’t eat them, good thing I see. 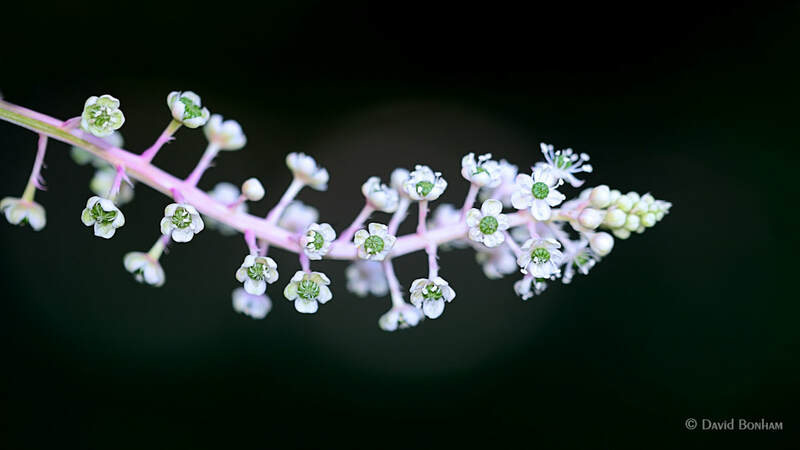 🙂 Nice shots, your capture of the pokeweed’s white blossoms is beautiful! Thank you. I was very happy the way the white blossoms turned out. Thank you very much Himanshi. Lovely post and photos, David. Very useful, too — I’ve always wondered (and been either too lazy or otherwise preoccupied) to look up what turns out to be poke berries. Also to echo Eliza’s comment above, I’m pretty sure that is a robber fly, a favorite of mine and not just because one rescued me from some deer flies once. (It certainly raised their esteem in my eyes, though.) It also looks like your robber has a little gnat on it proboscis for a little meal.